Heroes clash in a new Marvel Funko Pops animated short film! 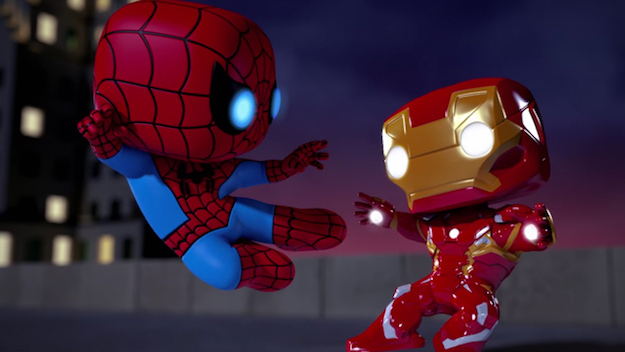 Marvel and Funko have collaborated to create the first ever Marvel Funko Pops animated short, “Spellbound.” This one features Spider-Man, Iron Man and Loki and you can check it out in the player below! In “Spellbound,” Spidey and Iron Man take on Loki only to have the webhead fall victim to the Asgardian foe’s mind controlling scepter. “Bait N Switch” will be the next Marvel Funko Pops animated short and it will premiere on December 7. It features Guardians of the Galaxy‘s Rocket Raccoon breaking into the Collector’s museum to try and set his buddy, Groot, free. “Chimichangas,” the third animated short, will premiere on 12/14 and features Deadpool facing off against Venom! The Marvel Funko Pops shorts include story and animation by A Large Evil Corporation and were executive produced by Brian Mariotti, Dan Buckley, Cort Lane, Joe Quesada and Alan Fine. What do you think of “Spellbound”? Are there any other Marvel Funko Pops you’d like to see featured in any upcoming installments? Let us know in the comments below!